If you’re thinking of buying your first rabbit or ferret, the Super Pet My First Home is the perfect choice. It’s the ultimate starter kit containing everything you need to bring your pet home successfully. Each cage is constructed from chew-proof coated wire and stain-resistant plastic parts. The deep scatterless base removes easily for quick cleaning. Easy snap-together assembly with no tools required. Measures 18 x 30 x 16 inches, which is compact enough to fit on your dresser or countertop. 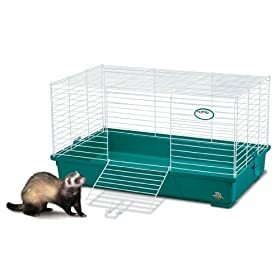 My first home is the perfect starter cage for your rabbit, ferret or guinea pig. It snaps together in minutes without the need for tools. My first home offers plenty of room for your favorite little critter, yet it is compact enough to place on a dresser or counter top. The deep plastic base prevents bedding from scattering while the white wire top makes for easy viewing and superb ventilation. With your own my first home, you too can discover wh Click here to Purchase!